Over the last 7 days, the Greater New York Red Cross provided emergency assistance to 134 adults and 53 children following 53 local disasters. Here are some highlights from last week and a preview of upcoming activities (see below). Teaming up with HHC-Woodhull, Hope Worldwide, and FDNY this weekend, the Red Cross installed a whopping 611 smoke alarms in Bed-Stuy (Brooklyn)! 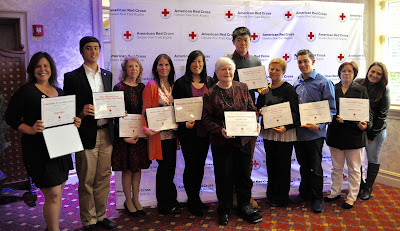 On Saturday we held our annual volunteer recognition event to honor our dedicated volunteers across Long Island. On Friday the Red Cross held an in-person Citizen Preparedness Training course at Robbins Lane Elementary School in Syosset (Long Island). You can schedule an in-person course today! Also on Friday, we took a look at Harlem’s local American Red Cross chapter and the great work they did for their community over the years. Bronx Times reported the Red Cross was helping two displaced families after a neighboring building collapsed during a windstorm in late February. On Thursday, Staten Island Disaster Program Manager Daniel Delgado gave a presentation on fire safety at a community forum, and shared some information on the Red Cross Home Fire Preparedness Campaign. Continuing our #MyRedCrossLife Instagram series, Mary Davis from Larchmouth, N.Y. talks about what it’s like to work as part of a highly-trained response team. A tradition going back to FDR, every March is proclaimed Red Cross Month by the President of the United States. The Long Island Herald provided some background coverage in honor of the tradition. Last week we posted a recap of our recent international humanitarian panel addressing the implications of the ongoing Refugee Crisis affecting Europe. Check out some highlights from the panel here. Mar 12, 16: March is Red Cross Month and we’ll be honoring our volunteers throughout the region with Recognition and Awards ceremonies in Metro New York North and Greater New York. Mar 19: The #GetAlarmedNYC campaign to install free lifesaving smoke alarms throughout our Greater New York region is coming to Port Richmond, Staten Island in less than two weeks. Volunteer or sign up for a free smoke alarm installation at www.redcross.org/GetAlarmedNYC. Apr 1-3: The Greater New York Red Cross is holding a 3-day Disaster Response Institute next month. Click here for more information on the summit. Apr 2: Next month Metro New York North will be holding its annual Red & White fundraising ball. It promises to be a great time! You can find out more here.